We will also come across many people of different ethnicity and of different cultural backgrounds. The native people of this area are Tamangs, Mangers, Gurungs, and Brahmins. You will be acquainted with their rich culture and traditions, religion, customs and their way of living. The locals are very friendly and welcoming you will be greeted with their utmost generosity. We Guide in Himalaya team and most of our guide and porters are also from the this area. 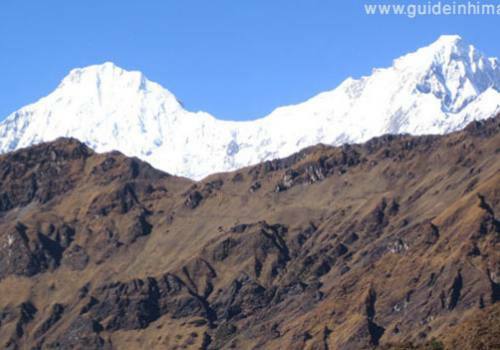 Another interesting feature of this trek is the presence of the precious Ruby stone and crystal stone in the region so this trekking area is newly named as “Ruby Valley Trekking” You will enjoy the majestic views of all the Ganesh Himal peaks, the height of Ganesh range (Ganesh I – V) around 7000 meters and as well as the glaciers, gorges, hot natural spas and charming Tamang villages. This trekking tour in the region is home stay and fully camping based which can only be organized as a full boarded camping trek in some areas.We start our trek from Betrawati, after driving almost four and half hours from Kathmandu for fully camping trek and our home stay trek to Ganesh Himal starts from Kintang Phedi in Dhading district through picturesque Tamang villages, their culture and unspoiled area of the country lead us to Singala la where Mountain View is terrific. Our Ganesh Himal itinerary is only original pattern that we GH provide you. We tailor that package that meets your requirements. Please kindly have a look our programs and write us if it has to be redesign for yourself.